1906 – Original cinematographer unknown. 1996 – New arrangement by Ken Jacobs. 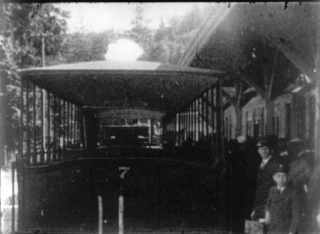 Shots shown as found in “A Trip Down Mount Tamalpais”, the Paper Print Collection, Library of Congress. Optically copied by Sam Bush, Western Cine Lab., Denver, from 16mm to 35mm letterbox format to allow double-image mirroring in 1:85 ratio projection. This performance was made possible by the generosity and co-operation of Frank Abbott and Nottingham Trent University. Thanks also Caroline Hennigan and Laraine Porter at the Broadway. The Nervous System places two identical film prints on two projectors capable of single frame advance and freeze. The twin prints step through the projectors frame by frame as dictated by the artist-projectionist, caught somewhere between movie and slideshow. They tend to advance slightly out of synchronisation, usually with only a single frame difference. Difference makes for movement and uncanny three dimensional space-illusions when a spinning propeller up front, between the two projectors, interrupts and alternates their cast images. Tiny shifts in the way the two images overlap onscreen create radically different visual effects. The throbbing flicker (avoid viewing if you have a history of epilepsy) is necessary to the creation of “eternalisms”, unfrozen slices of time, sustained movements going nowheres unlike anything in life. For instance, without discernible start and stop and repeat points, a neck may turn … eternally. I enjoy mining existing film, seeing more of what film remembers, what’s missed when it clicks by at Normal Speed. Normal Speed is good! It tells us stories and much more but it is inefficient at gleaning more than the surface from the film-ribbon. And there’s already so much film. Let’s draw some of it out for a deeper look, toy with it, take it into a new light with inventive and expressive projection. Freud would suggest doing so as a way to look into our minds. We’re urban creatures, after all, huddled for warmth against the great outside, living in movies. We lie down on the couch and remember movies. Illusion is what we recognise when we face facts, when we acknowledge the gullibility of our senses. Stage-tricks help reconcile us to our carrot-on-a-stick relationship to truth; the amusing illusion, seen as such, warns against delusion. A dose of formulated craziness can be refreshingly therapeutic! (see Hellzapoppin’, 1941). For instance: 21/2 D is hard to conceive. Things should either be flat or in depth. Yet the lit rectangle doubly cast by The Nervous System presents us with an impossible mix of the flat – our usual reading of forms reshaping as they slide across the screen, one with the screen, and the deep – here the screen punctured by the point formed by our twin sight lines, blown open, fragmented, its surface seemingly divided among myriad objects reaching forward and back of the actual screen-plane, and something in between, with both flat and deep claiming appearances unto their respective realms. Things get twisted, caught in this optical tug-of-war. It’s The Nervous System ! Putting the tangle into rectangle, and leaving it a wreck. Not only things pictured but the rectangle itself gets caught in the struggle and becomes spatially unstable, advancing or sinking in depth, stretching or compacting, leaning tilting swinging rising falling splitting, peeling off the screen The rectangle, itself in motion, becomes a creature of time. “Time / motion study” hardly suggests the exercise in ecstasy this can be. Or that we’re touching on the essence of cinema, its original impetus: vivisection of the moment. After a century of cinema industrialised, standardised, economically determined and “rationalised”, we need a return to the possibilities of a Cubist cinema (Cubism would’ve been unthinkable without the revelations of pioneering cinema). Opening fresh territory for sentient exploration, bringing spectacle forth from dross. Delving beyond the usual movie-message / cover-up to see the history that can be salvaged when film is wrested from glib 24fps. Toying with light, with phantasm, can also open time to fantastic changes. Temporal illusions of another order from the expansions/contractions of Griffith and Eisenstein – too emotionally congenial to register as modernist derangement and delirium, trigger the transcendent (rather than escapist) function of art. Explain a time, for instance, in which things race forward, with bursting velocity, and yet don’t for a moment budge … without the projectionist-performer’s permission. Time arrested in the act, while remaining time, i.e. with things remaining in motion. Wheels turning forward may even travel backwards (impossible to imagine) at the whim of the cine-puppeteer. Well, what moves the puppeteer? The very specific possibilities inherent to a particular strand of film. This frame times that frame equals… it’s anyone’s guess until discovery of the exact formula of projection adjustments makes it plain, allows it to happen, and often it’s an effect unique to that coupling; no two other pictures will do. Control, then, is a matter of attending very closely to what’s on the film. One tries this and that, but the givens of the shot, and their impact on the performer-projectionist, swing the action. Closing in on (to allow the expansion of) ever smaller pieces of time is my inviting Black Hole. Actor’s faces can stun me with boredom (movies are about actors.) I confess to feeling walled in by human faces altogether, not as misanthropic reaction but because the human colonisation of human experience, in our urban lives, is so thorough. It is astonishing to find oneself here with so many others to chat with, but isn’t this essentially a search party with our work cut out for us? We’ve gotten caught in the makings of our own minds and the only way out may be to enter into the workings of the mind. Film as itself the subject of film is the spell we enter wide-eyed, so as to get a grip on and pull apart the fibres of the phantasm. Film study is our opportunity to lay out the mind in strips. So – big breath – if picking at the texture of cinema at the end of its filmic phase (reality retreating further as our cine-solipsism goes electronic) seems about as inward as one can get, it’s because the name of this digging tool I’ve devised, The Nervous System, also designates a main territory of its search, that place where we’ve blithely applied mechanism to mind willy nilly producing that development of mind known as cinema. Micro and macro worlds are equally “out there”. 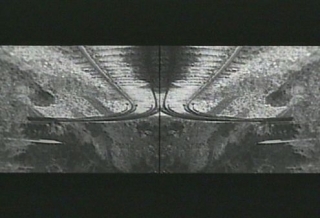 Divide (the moment) and conquer; advanced filmmaking leads to Muybridge and Marey.